Gov. Scott Walker’s deal with Foxconn was supposed to be the centerpiece of his reelection campaign. 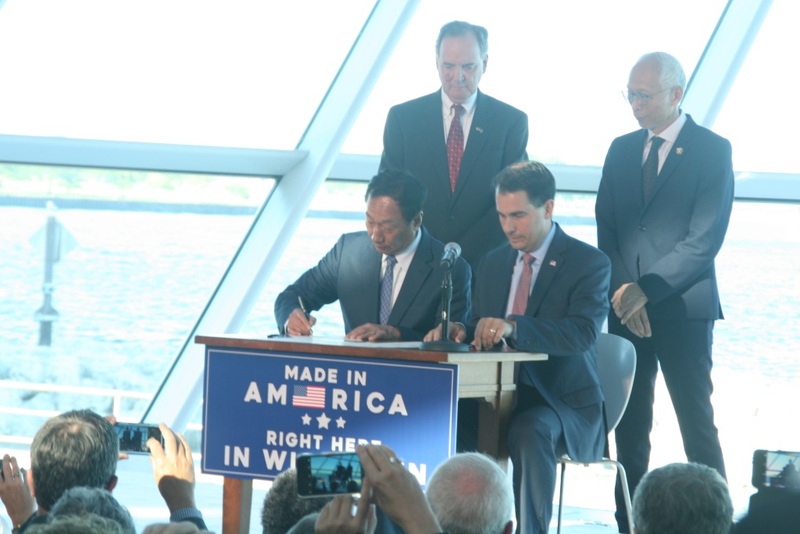 The ink was barely dry on the memorandum of understanding he signed with Foxconn CEO Terry Gou when conservative blogger David Blaska predicted the deal would assure Walker’s reelection. Urban Milwaukee’s Contrarian columnist George Mitchell suggested it made Walker a 10-point favorite in 2018. Former Republican staffer and Journal Sentinel columnist Christian Schneider hailed the proposed Foxconn plant in Racine County as an “epic” opportunity for the state, a “transformative” deal for the Wisconsin economy. For that matter, most Democrats held their fire, with both Milwaukee County Executive Chris Abele and Milwaukee Mayor Tom Barrett offering positive words for the deal. The day after signing the MOU, Walker toured Wisconsin on “a campaign-style airplane tour to make the case that the entire state would benefit from a plant three-times the size of the Pentagon,” as a Madison TV station reported. And after the legislature quickly signed the less-than-detailed deal, Walker made sure to maximize the impact, with a triumphant bill signing ceremony at Gateway Technical College near Racine. The ad got little attention but it demonstrated how obvious — and easy to explain — the objections to the deal were. And it soon became clear voters weren’t nearly as excited as Walker about the deal. In late October a Marquette University Law School poll of southeastern Wisconsin voters, those most likely to see some benefit from the deal, found that more respondents — 48 percent — thought the state incentives to Foxconn would cost more than the plant is worth, while only 38 percent thought the deal would be a net benefit for the state. Even in Racine County, where the plant will be located, more people thought the deal would be a net loser for the state. Two days later a survey by the Democratic firm, Public Policy Polling, found 34 percent of registered voters statewide supported the deal and 41 percent opposed it, with 26 percent undecided. Not long after this, Walker stopped talking about the Foxconn deal. On Monday, an adroit story by Journal Sentinel reporter Jason Stein caught the change: “After spending months touting” the deal, “the GOP governor didn’t mention Foxconn at his 2018 re-election kickoff on Sunday. He kept his distance again on Monday when conservative talk radio host Jerry Bader asked Walker about Sunday’s omission. As Scot Ross, head of the liberal group One Wisconsin Now, told Stein, if Walker isn’t mentioning Foxconn, it’s because the governor’s internal polling is showing the deal isn’t popular. Details of the Foxconn deal have been cloaked in secrecy and the state board which just approved it was not allowed to vote on the final contract, but only on the staff’s review of it. The $3 billion deal will cost every adult resident in Wisconsin $585 per person, and they won’t see a return on that money for 25 years. But that net gain, if and when it comes, is likely to be concentrated in southeastern Wisconsin. What’s in it for the rest of the state? That’s the kind of question that, ironically, candidate Scott Walker has pushed voters to consider. In the 2012 recall election, he made Milwaukee the villain, warning that a vote for his opponent, Mayor Barrett, could make the state more like its biggest city. Last December, as the Ashland Daily Press reported, Walker promised to spend more on rural roads because he would “Stop spending a billion and a half dollars on Milwaukee area projects” — meaning the reconstruction of I-94. Walker is a canny politician who understands that outstate people often feel overlooked. If they see no benefit in spending $1.5 billion to rebuild the most important and heavily used transportation connection in the state, why would they support a $3 billion project to create some jobs just off I-94 in Racine County? The logic and emotional appeal of Walker’s past campaigns is completely at odds with the Foxconn deal. Apparently in his desperation to provide some proof he has created jobs, the governor simply forget this. Maybe it’s because Wisconsinites can see through this “deal” for what it is? Corporate welfare. Giving a foreign company 3 billion dollars for soon-to-be automated or innovated away low pay jobs is a really really bad deal. This is what happens when you let a career politician who has mooched off the big government dole for 25 years and has never worked a single day in his adult life in the private sector or the free market to do your business deals Wisconsin. Meanwhile the roads are collapsing, education has been gutted, poverty rates are at 35 year highs in Wisconsin, the state has the fastest shrinking middle class in the country, Wisconsin is dead last in entrepreneurship and small business start ups, the state is in the midst of an opioid and alcoholism crisis (hint; poverty and hopelessness leads to things like Trump, alcoholism and the opioid crisis, so if the state is doing so great as Walker says, why are there so many chronic drunkards, pill poppers and angry bitter unemployed Trumpists in the state??) and now this charlatan and career politician wants to Governor for life!? We’ve been Foxconned! It’s time to tell Walker to take a hike! Corporate Welfare?? This has been standard for decades to get Mercury and other businesses to come and stay. For years we we’re opposed to it till it became obvious that the south was doing everything to steal business from the north, then the overseas countries stealing businesses from USA. It is fact of Life. Unless we wish to go back to being an agriculture state selling cheese. This is the best business deal in wis. history. That’s what the poll says. 54 percent believe it will substantially improve the economy of the Milwaukee area (an area where Walker doesn’t do so well). Democrats better be very careful before attacking this deal. Indeed, Carpenter and Wachs (who apparently worked to make it a better deal) have a much better approach than attacking a job creating deal that 54 percent of the Milwaukee area supports. But if we play games with numbers (and forget to mention the 54 percent) we can just jump into the same cesspool of defeat the Democrats in this state have been jumping into for about 40 years. @WCD, for AMERICAN companies!! Get it? American!! NOT 3 billion dollars of tax payer’s money which equates to the single largest corporate welfare check ever cut by a state for a Taiwanese, ahem , CHINESE company. They get our tax dollars and they pay zero taxes on their profits which will head right back to Taiwan. What part of that do you big government republicans not understand? Walker sold out Wisconsinites to a foreign company and now yes, Wisconsin has become Wississippi. @Matt, the vast majority of people in Northern Wisconsin are seriously outraged by this massive corporate welfare for a foreign company while we get nothing. Republicans, Trumpists and career politician Scott Walker lovers better not take us for granted or we will vote them out once and for all. We have the power. But it now appears that the contract only requires that Foxconn spend at least $9 billion not the $10 billion we were told to get the $3 billion from Wisconsin Taxpayers. Some how the $10 billion investment once the ink was put on paper shrunk to Foxconn investing at least $9 billion to get their hands on the $3 billion that Walker promised. Stop and think about that…….$3 billion of taxpayer money for 13,000 jobs. For gosh sakes $3 billion available to new start-ups would have far better served the state. But what everyone has failed to consider is that once the payments of $200-$300 million start each year for 15 consecutive years these payments must come out of the General Fund which means spending cuts will be needed. Will public schools and the U W system once again take a beating. I’ve repeatedly asked my Republican legislators where the money will come from to make these continuous payments. Guess what…….NO ANSWER! Wisconsinites are in for a royal screwing. @Jerry, yes you are 100% correct. This is the worst deal ever for Wisconson. Remember, those 13,000 jobs will most assuredly be automated or innovated away in the next few years. Big tech like this changes so fast and low pay wage slave workers are needed less and less. It’s so.sad to see vulnerable desperate people in Wississippi taken advantage of. The only good thing that will come from this epic disaster is the state will probably be forced to finally end cannabis prohibition, creating 18-20,000 new jobs and hundreds of millions in new tax revenue just to offset the billions career politician Scott Walker squandered on this corporate welfare and unmitigated boondoggle. Democratic capitalism rests on a three-legged stool of shareholder, worker, and consumer rights. It’s government’s job to balance those. This was a staggering amount of multi-level, decades long, corporate welfare. Bruce, what woulda been totally rad is if you had written this column last THursday. NOw you’re just piling on. Hope you don’t get 15 yards for roughing the passer. Although WI would fare better with Walker on the sidelines than the Packer’s with Rodgers on the IR. Lemme hear you predict Vos primaries Walker. Let’s just predict that there won’t be a lot of FOXCONN activity heading towards the 2018 election and and that it shrivels and dies shortly thereafter. -As of now they don’t own any property. -Plant production equipment needs to be ordered & installed . -It would take a year to build the structure and get local utilities in place. -Looks like 2020 ( + ) before there could be any production. Just for your special edification; WI is still an agricultural state, we have lots of cows, and we sell lots of cheese, A LOT OF CHEESE. If you ever crawled out of you cellar you would know that. . The value of that cheese was $43.4 billion. WCD – May I remind you of this article. It’s not just the act of corporate welfare, which all politicians engage in, it’s the sheer size of it. I’m sorry, but you know in your heart that this is an OK deal at the VERY best, assuming every positive spin and all job projections (exaggerations) actually play out. Walker has been a welfare queen his whole adult life. This 3 billion dollars will have to be paid back by future generations like our roads, schools and all the rest of the GOP unpaid bills. People don’t forget Mt. Pleasant and Racine gave this unstable foreign company 800 million dollars too. Will they build a wall around this plant to keep workers from leaving? They also just opened their Chinese plant the same size as this one. These TVS will be outdated in the near future. Good luck on getting your money back. It’s just another GOP scam. There is a huge facility that was built near Chicago producing the same product that now sits empty. THE STATE IS BEING SCREWED! Looks like a pretty good ROI, wouldn’t you say? IF even a fraction of these jobs materialize, I’ll be shocked. We desperately need to vote these morons out of office, redraw boundaries by eliminating Republican gerrymandering, and figure out ways to help rural Western and Northern WI in ways that don’t also hurt Milwaukee and Madison. $3B being invested over 20 years would be absolutely transformative if it went towards job training, adult education, seed funding for business start ups, etc. But we’ll get saddled with an albatross never given to a WI (let alone American) company. Imagine $3B given to Epic, you’d see a lot more than 13K jobs – jobs that likely won’t be gone before the subsidies end. Honesty, all the actions done by our Legislature and Walker will (and are already) make our state less educated, less competitive, less healthy, less beautiful, and less desirable to transplants and immigrants. 1.) The Foxconn contract was signed less than 4 days ago. 3.) “Meanwhile the promised plant has shrunk in value from $10 billion to $9 billion.” Nonetheless, Walker is still stating $10 billion. 4.) Disclosed after the contract signing: Foxconn wants its own dedicated traffic lane on I-94 from Milwaukee. “Among those challenges are increased traffic and the problem of getting huge numbers of workers — Foxconn says it will employ as many as 13,000 — to a semi-rural area 8 miles west of downtown Racine and more than 20 miles from downtown Milwaukee. But with state money earmarked to widen I-94 to eight lanes and plans in place to improve local roads, Sheehy said regional officials “thought we were ahead of the curve” on traffic issues. Then they briefed Foxconn on the accomplishments. As a result, he said, state transportation planners were asked to consider the possibility. The Department of Transportation is doing just that, a spokesman said Monday. “Yes, it is something we are looking at,” said Michael Pyritz, spokesman for the department’s southeast region. Pyritz said the process of evaluating and making final decisions on upgrades to I-94 and other roads near the planned Foxconn complex in Mount Pleasant “is a work in progress,” with many options being weighed.